I have arrived at the enviable age when I can proudly say that I'm an old geezer. Thus I have attained the privilege of being opinionated, a privilege properly reserved for those among us that have been there and done that. 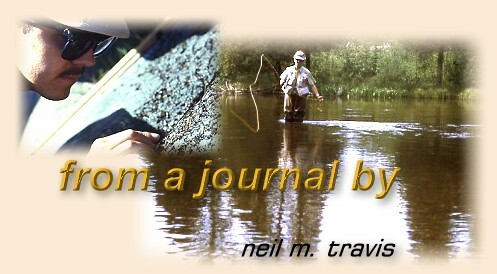 With over 55 years of fishing experience, and with 40 plus years of fly-fishing experience carved out of those years I believe that I have obtained the necessary time and grade to postulate an informed opinion on things pertaining to sports fishing in general and fly-fishing in particular. Shakespeare wrote that 'a rose by any other name would smell as sweet,' and while that might be true of roses such cannot be said of other things. Just as fine dining is different than eating a burger and fries at a fast food joint, so is real fly-fishing different than merely a method of catching fish. I have concluded that, in general, sport fishing can be broken down into two basic components - method and purpose. It can hardly be argued that fly-fishing is, nor was it ever intended to be, the most effective method of catching fish. Nets, dynamite, and a host of other less delicate methods will put more fish on the stringer than fly-fishing. If the purpose of fly-fishing was not intended to be the most effective way of catching fish then the reason for fly-fishing must be found in the method. I recently retired after 23 years as a criminal and civil law judge in Montana. During my extended tenure on the bench one of the things that always pricked my interest, especially in criminal cases, was the motive of the offender. This was especially true when I was dealing with youthful offenders, particularly those that had been arrested for the first time. Remarkably, most could not tell me a reason, and the most common answer was, "I don't know." The mere fact that they could not articulate a reason, any reason, was quite interesting and troubling to me. When a person begins to act without cognitive thought behind their action they have entered a dangerous place. That is what I believe has happened to fly-fishing. Whatever has caused the spike of interest in fly-fishing in the last couple decades has created a plethora of would be fly-flingers that I suspect do not have a clue why they are fly-fishing except that it is cool, they saw a movie, or it just is the 'in thing' to do. I have watched in horror as some guy, clutching a fly rod, jumped into his pontoon boat that was festooned with more gadgets and do-dads than a sea-going sports fisher headed out for a day of deep-sea fishing. Strapped on the rear was an electric trolling motor; at the ready were a fish finder, GPS system, recording thermometer, and even a two-way radio for communications with his buddies in their boats. The flies in his fly box looked more like lures that had a bit of fur and yarn attached. Any day now I expect to see a pontoon boat equipped with down riggers! What's wrong with this picture? Hewitt, Gordon, Skues, Marinaro, Schwiebert, and a host of other greats both past and present would be quick to answer, "It may be fishing, but it's not fly-fishing!" These greats knew that fly-fishing is not a pragmatic sport, but a sport that measures success not by the method but by the motive. It is the practice of the sport of fly-fishing, using methods that require skills that need to be learned by practice and not by mechanical means. There are no shortcuts, no winking at traditions, no close enough is good enough attitude, and certainly no trolling motors or fish finders. Some might argue that they are using flies, they do catch fish, and the technique does work. As they proceed to troll up and down using their electric motors for propulsion they look just like the guys fishing hardware. They don't have to be great casters, accuracy and presentation are unnecessary skills, imitation is an afterthought, and most of the other skills once thought essential for a person to call themselves fly-fishers are completely lacking. They are nothing but glorified lure flingers using fly-fishing equipment. If you see yourself in this description, and you are offended that I have labeled you a glorified lure flinger you will find me unapologetic. I've paid my dues, and I don't need or want fish finders, trolling motors, or other electronic marvels to enhance my fly-fishing. I spent time learning about casting, and hours of practice to perfect it because that is one of the essential components of fly-fishing. I learned about what fish eat, and how to tie imitations that resemble those food items. I learned about how fish live, where they feed, and how to present a fly in a manner that resembles their natural food. I've been there and done that, and I even have the shirt! If I wanted to catch trout by trolling with an electric motor and locating the fish with a fish finder I'd buy a V-hulled aluminum boat with a trolling motor, a tackle box full of spoons and flashers, and a stout trolling rod. It would be effective, but about as much fun as watching grass grow. Before you knot your rope and start searching for a sturdy tree to hang me from understand that I own a pontoon boat; oars or fins propel it. I do fish with imitations that resemble leeches, damsel and dragonflies, and a variety of other patterns tied to imitate natural trout food forms. I present these imitations in the most natural way possible in locations where my study and experience tell me that trout may be feeding. In short, I am a fly-fisher both in practice and motive.